The following is historical spending on defense from 1996-2015, spending for 2014-15 is estimated. The Defense Budget is shown in billions of dollars and total budget in trillions of dollars. The percentage of the total U.S. federal budget spent on defense is indicated in the third row, and change in defense spending from the previous year in the final row. The MHS offers a rich health care benefit to 9.5 million eligible beneficiaries, which includes active military members and their families, military retirees and their families, dependent survivors, and certain eligible Reserve Component members and their families. The Unified Medical Budget (UMB), which comprises the funding and personnel needed to support the MHS’ mission, consumes nearly 9% of the Department’s topline budget authority. Thus, it is a significant line item in the Department’s financial portfolio. For the 2011 fiscal year, the president's base budget for the Department of Defense and spending on "overseas contingency operations" combine to bring the sum to US$664.84 billion. When the budget was signed into law on 28 October 2009, the final size of the Department of Defense's budget was $680 billion, $16 billion more than President Obama had requested. An additional $37 billion supplemental bill to support the wars in Iraq and Afghanistan was expected to pass in the spring of 2010, but has been delayed by the House of Representatives after passing the Senate. The recent military operations in Iraq and Afghanistan were largely funded through supplementary spending bills outside the federal budget, which are not included in the military budget figures listed below. However, the wars in Iraq and Afghanistan were categorized as "overseas contingency operations" in the starting of the fiscal year 2010, and the budget is included in the federal budget. By the end of 2008, the U.S. had spent approximately $900 billion in direct costs on the wars in Iraq and Afghanistan. The government also incurred indirect costs, which include interests on additional debt and incremental costs, financed by the Veterans Administration, of caring for more than 33,000 wounded. Some experts estimate the indirect costs will eventually exceed the direct costs. As of June 2011, the total cost of the wars was approximately $1.3 trillion. The federally budgeted (see below) military expenditure of the United States Department of Defense for fiscal year 2013 are as follows. While data is provided from the 2015 budget, data for 2014 and 2015 is estimated, and thus data is shown for the last year for which definite data exists (2013). The Department of Defense's FY 2011 $137.5 billion procurement and $77.2 billion RDT&E budget requests included several programs worth more than $1.5 billion. 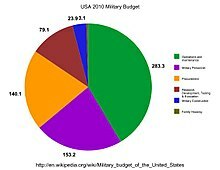 This does not include many military-related items that are outside of the Defense Department budget, such as nuclear weapons research, maintenance, cleanup, and production, which are in the Atomic Energy Defense Activities section, Veterans Affairs, the Treasury Department's payments in pensions to military retirees and widows and their families, interest on debt incurred in past wars, or State Department financing of foreign arms sales and militarily-related development assistance. Neither does it include defense spending that is not military in nature, such as the Department of Homeland Security, counter-terrorism spending by the Federal Bureau of Investigation, and intelligence-gathering spending by NSA. Again in 2011, the GAO could not "render an opinion on the 2011 consolidated financial statements of the federal government", with a major obstacle again being "serious financial management problems at the Department of Defense (DOD) that made its financial statements unauditable". In December 2011, the GAO found that "neither the Navy nor the Marine Corps have implemented effective processes for reconciling their FBWT." According to the GAO, "An agency's FBWT account is similar in concept to a corporate bank account. The difference is that instead of a cash balance, FBWT represents unexpended spending authority in appropriations." In addition, "As of April 2011, there were more than $22 billion unmatched disbursements and collections affecting more than 10,000 lines of accounting." The US Government Accountability Office (GAO) was unable to provide an audit opinion on the 2010 financial statements of the US Government because of 'widespread material internal control weaknesses, significant uncertainties, and other limitations'. The GAO cited as the principal obstacle to its provision of an audit opinion 'serious financial management problems at the Department of Defense that made its financial statements unauditable'. In FY 2010, six out of thirty-three DoD reporting entities received unqualified audit opinions. Chief financial officer and Under Secretary of Defense Robert F. Hale acknowledged enterprise-wide problems with systems and processes, while the DoD's Inspector General reported 'material internal control weaknesses ... that affect the safeguarding of assets, proper use of funds, and impair the prevention and identification of fraud, waste, and abuse'. Further management discussion in the FY 2010 DoD Financial Report states 'it is not feasible to deploy a vast number of accountants to manually reconcile our books' and concludes that 'although the financial statements are not auditable for FY 2010, the Department's financial managers are meeting warfighter needs'. On February 9, 2016, the US Department of Defense under President Obama released a statement outlining the proposed 2016 and 2017 defense spending budgets that "[reflect] the priorities necessary for our force today and in the future to best serve and protect our nation in a rapidly changing security environment." In February 2018, the Pentagon requested $686 billion for FY 2019. The John S. McCain National Defense Authorization Act authorized Department of Defense appropriations for 2019 and established policies, but it did not contain the budget itself. On July 26, this bill passed in the House of Representatives by 359-54. On August 1, the US Senate passed it by 87-10. The bill was presented to President Trump two days later. He signed it on August 13. On September 28, 2018, Trump signed the Department of Defense appropriations bill. The approved 2019 Department of Defense budget is $686.1 billion. It has also been described as "$617 billion for the base budget and another $69 billion for war funding." On March 16, 2017 President Trump submitted his request to Congress for $639 billion in military spending—$54 billion—which represents a 10 percent increase—for FY 2018 as well as $30 billion for FY2017 which ends in September. With a total federal budget of $3.9 trillion for FY2018, the increase in military spending would result in deep cuts to many other federal agencies and domestic programs, as well as the State Department. Trump had pledged to "rebuild" the military as part of his 2016 Presidential campaign. In April 2017, journalist Scot J. Paltrow raised concerns about the increase in spending with the Pentagon's history of "faulty accounting". On the 14th of July, H.R. 2810 the National Defense Authorization Act 2018 was passed by the U.S. House of Representatives 344 - 81, with 8 not voting. 60% of Democrats voted for this bill, which represented an 18% increase in defense spending. The Congress increased the budget to total 696 billion dollars. The currently available budget request for 2017 was filed on February 9, 2016, under now former-President Barack Obama. The FY 2017 budget reflects recent strategic threats and changes that have taken place in Asia, the Middle East and Europe. Russian aggression, terrorism by the Islamic State of Iraq and the Levant (ISIL) and others, and China's island building and claims of sovereignty in international waters all necessitate changes in our strategic outlook and in our operational commitments. Threats and actions originating in Iran and North Korea negatively affect our interests and our allies. These challenges have sharpened the focus of our planning and budgeting. The proposal also includes a comparison of the 2016 and the proposed 2017 request amounts, a summary of acquisitions requested for 2017 and enacted in 2016, and provides in detail a breakdown of specific programs to be funded. Amounts are in $ billions. $ in billions, Qty being the number of items requested. This portion of the military budget comprises roughly one third to one half of the total defense budget, considering only military personnel or additionally including civilian personnel, respectively. These expenditures will typically be, the single largest expense category for the Department. Since 2001, military pay and benefits have increased by 85%, but remained roughly one third of the total budget due to an overall increased budget. Military pay remains at about the 70th percentile compared to the private sector to attract sufficient amounts of qualified personnel. The request for 2017 amounts to $48.8 billion. The system has 9.4 million beneficiaries, including active, retired, and eligible Reserve Component military personnel and their families, and dependent survivors. The role of support service contractors has increased since 2001 and in 2007 payments for contractor services exceeded investments in equipment for the armed forces for the first time. In the 2010 budget, the support service contractors will be reduced from the current 39 percent of the workforce down to the pre-2001 level of 26 percent. In a Pentagon review of January 2011, service contractors were found to be "increasingly unaffordable." The U.S. Department of Defense budget accounted in fiscal year 2017 for about 14.8% of the United States federal budgeted expenditures. According to the Congressional Budget Office, defense spending grew 9% annually on average from fiscal year 2000–2009. Because of constitutional limitations, military funding is appropriated in a discretionary spending account. (Such accounts permit government planners to have more flexibility to change spending each year, as opposed to mandatory spending accounts that mandate spending on programs in accordance with the law, outside of the budgetary process.) In recent years, discretionary spending as a whole has amounted to about one-third of total federal outlays. Department of Defense spending's share of discretionary spending was 50.5% in 2003, and has risen to between 53% and 54% in recent years. For FY 2017, Department of Defense spending amounts to 3.1% of GDP. Because the U.S. GDP has grown over time, the military budget can rise in absolute terms while shrinking as a percentage of the GDP. For example, the Department of Defense budget was slated to be $664 billion in 2010 (including the cost of operations in Iraq and Afghanistan previously funded through supplementary budget legislation), higher than at any other point in American history, but still 1.1–1.4% lower as a percentage of GDP than the amount spent on military during the peak of Cold-War military spending in the late 1980s. Admiral Mike Mullen, former Chairman of the Joint Chiefs of Staff, has called four percent an "absolute floor". This calculation does not take into account some other military-related non-DOD spending, such as Veterans Affairs, Homeland Security, and interest paid on debt incurred in past wars, which has increased even as a percentage of the national GDP. In 2015, Pentagon and related spending totaled $598 billion. In addition, the United States will spend at least $179 billion over the fiscal years of 2010-2018 on its nuclear arsenal, averaging $20 billion per year. Despite President Barack Obama's attempts in the media to reduce the scope of the current nuclear arms race, the U.S. intends to spend an additional $1 trillion over the next 30 years modernizing its nuclear arsenal. In September 2017 the United States Senate followed President Donald Trump's plan to expand military spending, which will boost spending to $700 billion, about 91.4% of which will be spent on maintaining the armed forces and primary Pentagon costs. Military spending is increasing regularly and more money is being spent every year on employee pay, operation and maintenance, and benefits including as health benefits. Methods to counteract rapidly increasing spending include shutting down bases, but that has been banned since an Obama administration Budget Act included a section that stopped just that. 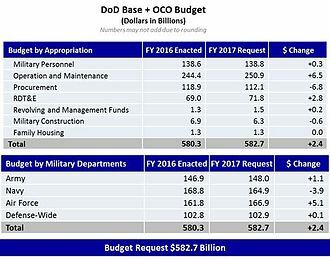 As of September 2014, the Department of Defense was estimated to have "$857 million in excess parts and supplies". This figure has risen over the past years, and of the Pentagon waste that has been calculated, two figures are especially worth mentioning: the expenditure of "$150 million on private villas for a handful of Pentagon employees in Afghanistan and the procurement of the JLENS air-defense balloon" which, throughout the program's development over the past two decades, is estimated to have cost $2.7 billion. One problem with military spending is waste that comes from poor cost estimation. The armed forces are seemingly unable to properly estimate costs, which ends up wasting billions of dollars annually. What is more, there are instances such as in the research and development department where costs are underestimated, which leads to a waste of a different kind: time. Without the appropriate resources, researchers cannot do their job adequately. What this can lead to is employees not working as efficiently as possible. The United States spends more on their defense budget than China, Saudi Arabia, Russia, the United Kingdom, India, France, and Japan combined. The 2018 U.S. military budget accounts for approximately 38% of global arms spending (for comparison, U.S. GDP is only 24% of global GDP). The 2018 budget is approximately four times larger than the $168 billion military budget of China. The United States and its close allies are responsible for two-thirds to three-quarters of the world's military spending (of which, in turn, the U.S. is responsible for the majority). The US also maintains the largest number of military bases on foreign soil across the world. While there are no freestanding foreign bases permanently located in the United States, there are now around 800 U.S. bases in foreign countries. Military spending makes up nearly 16% percent of entire federal spending and approximately half of discretionary spending. In a general sense discretionary spending (defense and non-defense spending) makes up one-third of the annual federal budget. In 2015, out of its budget of 3.97 trillion, the United States spent $637 billion on military. In 2016, the United States spent 3.29% of its GDP on its military (considering only basic Department of Defense budget spending), more than France's 2.26% and less than Saudi Arabia's 9.85%. This is historically low for the United States since it peaked in 1944 at 37.8% of GDP (it reached the lowest point of 3.0% in 1999–2001). Even during the peak of the Vietnam War the percentage reached a high of 9.4% in 1968. The US Military's budget has plateaued in 2009, but is still considerably larger than any other military power. Military spending is important to the Trump administration and it is unlikely that he has any reason to curb it. In addition, military spending is popular with 2017 House Speaker Paul Ryan, showing that U.S. military spending will continue to stay high as compared with other countries. When accounting for Military Expenditure by % of GDP, the United States ranks 21st. In 2009, Secretary of Defense Robert Gates wrote that the U.S. should adjust its priorities and spending to address the changing nature of threats in the world: "What all these potential adversaries—from terrorist cells to rogue nations to rising powers—have in common is that they have learned that it is unwise to confront the United States directly on conventional military terms. The United States cannot take its current dominance for granted and needs to invest in the programs, platforms, and personnel that will ensure that dominance's persistence. But it is also important to keep some perspective. As much as the U.S. Navy has shrunk since the end of the Cold War, for example, in terms of tonnage, its battle fleet is still larger than the next 13 navies combined—and 11 of those 13 navies are U.S. allies or partners." Secretary Gates announced some of his budget recommendations in April 2009. According to a 2009 Congressional Research Service there was a discrepancy between a budget that is declining as a percentage of GDP while the responsibilities of the DoD have not decreased and additional pressures on the military budget have arisen due to broader missions in the post-9/11 world, dramatic increases in personnel and operating costs, and new requirements resulting from wartime lessons in the Iraq War and Operation Enduring Freedom. Most of the $5 billion in budget "cuts" for 2013 that were mandated by Congress in 2012 really only shifted expenses from the general military budget to the Afghanistan war budget. Declaring that nearly 65,000 troops were temporary rather than part of the permanent forces resulted in the reallocation of $4 billion in existing expenses to this different budget. In May 2012, as part of Obama's East Asia "pivot", his 2013 national military request moved funding from the Army and Marines to favor the Navy, but the Congress has resisted this. Reports emerged in February 2014 that Secretary of Defense Chuck Hagel was planning to trim the defense budget by billions of dollars. The secretary in his first defense budget planned to limit pay rises, increase fees for healthcare benefits, freeze the pay of senior officers, and reduce military housing allowances. A reduction in the number of soldiers serving in the U.S. Army would reduce the size of the force to levels not seen since prior to the start of World War II. In July 2014, American Enterprise Institute scholar Michael Auslin opined in the National Review that the Air Force needs to be fully funded as a priority, due to the air superiority, global airlift, and long-range strike capabilities it provides. In January 2015 Defense Department published its internal study on how to save $125 billion on its military budget from 2016 to 2020 by renegotiating vendor contracts and pushing for stronger deals, and by offering workers early retirement and retraining. On 5 December 2012, the Department of Defense announced it was planning for automatic spending cuts, which include $500 billion and an additional $487 billion due to the 2011 Budget Control Act, due to the fiscal cliff. According to Politico, the Department of Defense declined to explain to the House of Representatives Appropriations Committee, which controls federal spending, what its plans were regarding the fiscal cliff planning. The Government Accountability Office was unable to provide an audit opinion on the 2010 financial statements of the U.S. government due to "widespread material internal control weaknesses, significant uncertainties, and other limitations." The GAO cited as the principal obstacle to its provision of an audit opinion "serious financial management problems at the Department of Defense that made its financial statements unauditable." In Fiscal Year (FY) 2011, seven out of 33 DoD reporting entities received unqualified audit opinions. Under Secretary of Defense Robert F. Hale acknowledged enterprise-wide weaknesses with controls and systems. Further management discussion in the FY 2011 DoD Financial Report states "we are not able to deploy the vast numbers of accountants that would be required to reconcile our books manually". Congress has established a deadline of FY 2017 for the DoD to achieve audit readiness. For FYs 1998-2010 the Department of Defense's financial statements were either unauditable or such that no audit opinion could be expressed. Several years behind other government agencies, the first results from an army of about 2,400 contracted DoD auditors are expected on November 15, 2018. In a statement of 6 January 2011 Defense Secretary Robert M. Gates stated: "This department simply cannot risk continuing down the same path – where our investment priorities, bureaucratic habits and lax attitude towards costs are increasingly divorced from the real threats of today, the growing perils of tomorrow and the nation's grim financial outlook." Gates has proposed a budget that, if approved by Congress, would reduce the costs of many DOD programs and policies, including reports, the IT infrastructure, fuel, weapon programs, DOD bureaucracies, and personnel. The 2015 expenditure for Army research, development and acquisition changed from $32 billion projected in 2012 for FY15, to $21 billion for FY15 expected in 2014. In 2018, it was announced that the Department of Defense was indeed the subject of a comprehensive budgetary audit. This review was conducted by private, third-party accounting consultants. The audit ended and was deemed incomplete due to deficient accounting practices in the department. ^ a b c d e f g "Defense Budget Overview" (PDF). ^ a b "Historical Tables, Budget of the United States Government, Fiscal Year 2015". United States Government Publishing Office. 2015. Retrieved 1 January 2015. ^ Street, 351 Pleasant; MA, Suite B. #442 Northampton. "Overseas Contingency Operations: The Pentagon Slush Fund". National Priorities Project. Retrieved 15 February 2019. ^ "Department of Defense" (PDF). Archived from the original (PDF) on 7 January 2012. Retrieved 26 February 2014. ^ "Senate OKs defense bill, 68-29". TheHill. 23 October 2009. Retrieved 25 March 2015. ^ Trotta, Daniel (29 June 2011). "Cost of war at least $1.3 trillion and counting". Reuters. Retrieved 25 November 2012. ^ "Death and Taxes". wallstats.com. Retrieved 25 March 2015. ^ "U.S. Intelligence Budget Data". Fas.org. Retrieved 25 November 2012. ^ "Significant Financial Management and Fiscal Challenges Reflected in the U.S. Government's 2011 Financial Report". US Government Accountability Office. Retrieved 2 January 2012. ^ Office, U. S. Government Accountability (20 December 2011). "DOD Financial Management: Ongoing Challenges with Reconciling Navy and Marine Corps Fund Balance with Treasury" (GAO-12–132). US Government Accountability Office. Retrieved 2 January 2012. ^ a b "US Government's 2010 Financial Report Shows Significant Financial Management and Fiscal Challenges". US Government Accountability Office. Retrieved 6 January 2011. ^ "FY 2010 DoD Agencywide Agency Financial Report (vid.)" (PDF). US Department of Defense. p. 25. Archived from the original (PDF) on 14 December 2010. Retrieved 7 January 2011. ^ "FY 2010 DoD Agencywide Agency Financial Report (vid. p.18)" (PDF). US Department of Defense. Archived from the original (PDF) on 14 December 2010. Retrieved 7 January 2011. ^ "FY 2010 DoD Agencywide Agency Financial Report (vid. p.32)" (PDF). US Department of Defense. Archived from the original (PDF) on 14 December 2010. Retrieved 7 January 2011. ^ "FY 2010 DoD Agencywide Agency Financial Report (vid. pp. 20, 28)" (PDF). US Department of Defense. Archived from the original (PDF) on 14 December 2010. Retrieved 7 January 2011. ^ a b c d e "Department of Defense (DoD) Releases Fiscal Year 2017 President's Budg". U.S. Department of Defense. Retrieved 22 February 2017. ^ Rizzo, Jennifer (12 February 2018). "Pentagon asks for major budget increase amid threats from Russia, China and North Korea". CNN. Retrieved 13 February 2018. ^ John S. McCain National Defense Authorization Act For Fiscal Year 2019 Conference Report To Accompany H.R. 5515 (PDF). US Congress. p. 1181. Retrieved 3 August 2018. ^ "Roll Call Vote 115th Congress - 2nd Session". US Senate. ^ "H.R.5515". US Congress. 13 August 2018. ^ "DoD Topline: FY 2001 - FY 2019". Department of Defense. Retrieved 8 December 2018. ^ Cancian, Mark (4 October 2018). "The High Times May Be Ending For U.S. Defense Spending". Forbes. Retrieved 8 December 2018. ^ a b Cohen, Zachary (26 March 2017). "Trump proposes $54 billion defense spending hike". CNN. Retrieved 27 March 2017. ^ Taylor, Andrew (16 March 2017). "Trump budget would slash domestic programs to boost military". The Boston Globe. Washington. Associated Press. Retrieved 27 March 2017. ^ a b Rampton, Roberta; Cowan, Richard (16 March 2017). "Trump's budget seeks to boost military, slash other federal agencies". Reuters. Retrieved 16 March 2017. ^ Taylor, Andrew (16 March 2017). "Trump budget would slash domestic programs to boost military". The Boston Globe. Associated Press. Retrieved 16 March 2017. ^ Tiefer, Charles. "President Trump Is Likely To Boost U.S. Military Spending By $500 Billion To $1 Trillion". Forbes. Retrieved 22 February 2017. ^ a b c d e United States Department of Defense Fiscal Year 2017 Budget Request (PDF). Office of the Under Secretary of Defense. 2016. ^ Sandra I. Erwin (June 2007). "More Services, Less Hardware Define Current Military Buildup". Defense Watch. National Defense Industrial Association. Retrieved 6 December 2009. ^ "Secretary of Defense Testimony: Defense Budget Recommendation Statement (Arlington, VA)". defense.gov. Archived from the original on 7 March 2015. Retrieved 25 March 2015. ^ Liebelson, Dana. "NYT Misses Elephant in the Room: Defense Service Contractors." POGO, 3 January 2012. ^ "Monthly Budget Review" (PDF). Congressional Budget Office. Retrieved 25 March 2015. ^ "Fiscal Year 2002 Budget". Center for Defense Information. Archived from the original on 27 November 2005. Retrieved 13 July 2006. ^ Mike Carney (22 October 2007). "Bush submits $42.3B Iraq war supplemental funding bill". USA Today. Retrieved 6 October 2009. ^ AUGUST COLE (5 February 2008). "Bush's Successor to Confront Tough Decisions on Defense". Wall Street Journal. Retrieved 6 October 2009. ^ "Senate backs massive increase in military spending". Reuters. 19 September 2017. Retrieved 24 November 2017. ^ "Here's the $250 Billion in Hidden Military Spending". The Balance. Retrieved 24 November 2017. ^ Hartung, William (2016). "Don't Get Fooled Again: Pentagon Waste and Congressional Oversight". Center for International Policy. ^ Eaglen, Mackenzie. "U.S. Defense Spending: The Mismatch Between Plans and Resources". The Heritage Foundation. Retrieved 24 November 2017. ^ "U.S. Defense Spending Compared to Other Countries". www.pgpf.org. Retrieved 3 February 2017. ^ "U.S. US GDP as % of World GDP". ycharts.com. Retrieved 8 March 2019. ^ "World Military Spending". globalissues.org. Retrieved 25 March 2015. ^ "World Wide Military Expenditures". GlobalSecurity.org. 2006. Retrieved 10 May 2010. ^ "The FY 2009 Pentagon Spending Request – Global Military Spending". armscontrolcenter.org. Center for Arms Control and Non-proliferation. Retrieved 26 April 2013. ^ "Tomgram: Nick Turse, The Pentagon's Planet of Bases". tomdispatch.com. Retrieved 25 March 2015. ^ "The United States spends roughly 16 percent of all federal spending and almost half of discretional spending". pgpf.org. 3 May 2017. Retrieved 12 May 2017. ^ CIA World Factbook. "Rank Order – Military expenditures percent of GDP". Retrieved 8 March 2019. ^ "Relative Size of US Military Spending from 1940 to 2003". TruthAndPolitics.org. Archived from the original on 21 April 2004. ^ Schoen, John W. (2 May 2017). "Here's how US defense spending stacks up against the rest of the world". CNBC. Retrieved 24 November 2017. ^ "Military expenditure (% of GDP) | Data". data.worldbank.org. Retrieved 30 March 2019. ^ "Speech". Defense.gov. Retrieved 25 November 2012. ^ "Robert Gates follows through on his promises to reform the Pentagon". Slate Magazine. 6 April 2009. Retrieved 25 March 2015. ^ Rumbaugh, Russell. "What We Bought: Defense Procurement from FY01 to FY10 (Oct. 31, 2011)". Stimson Center. Retrieved 6 December 2017. ^ Weinstein, Adam (2 November 2011). "Report: Military Blew $1 Trillion on Weapons Since 9/11". Mother Jones. Retrieved 6 December 2017. ^ Bender, Bryan. "Pentagon accused of end run on budget cuts." Boston Globe. 3 March 2012. ^ Pellerin, Cheryl. "Carter: DOD Puts Strategy Before Budget for Future Force." American Forces Press Service, 30 May 2012. ^ "Pentagon plan looks at lean, mean US army". The US News. Retrieved 24 February 2014. ^ "National Review". National Review Online. 24 July 2014. Retrieved 25 March 2015. ^ Cooper, Helene (6 December 2016). "Pentagon Denies Suppressing Study on Ways to Save $125 Billion". The New York Times. ISSN 0362-4331. Retrieved 26 February 2017. ^ Wright, Robert (7 December 2012). "Why Not Push the Pentagon off the Fiscal Cliff?". The Atlantic. Retrieved 7 December 2012. ^ Martinez, Luis (5 December 2012). "Pentagon Begins Planning for $500B in 'Fiscal Cliff' Cuts". ABC. Retrieved 8 December 2012. ^ Mount, Mike (5 December 2012). "Pentagon told to start planning for fiscal cliff cuts". CNN. Retrieved 8 December 2012. ^ "After months of delay, Pentagon told to plan for 'fiscal cliff'". Indian Express. 6 December 2012. Retrieved 8 December 2012. ^ Alexander, David (5 December 2012). "UPDATE 2-After months of delay, Pentagon told to plan for 'fiscal cliff'". Reuters. United Kingdom Reuters. Retrieved 8 December 2012. ^ Sherman, Jake; Bresnahan, John; Budoff-Brown, Carrie (6 December 2012). "W.H. to House GOP: We're not moving". Politico. p. 2. Retrieved 8 December 2012. ^ Darren Samuelsohn & Stephanie Gaskell. "Many old-time defense hawks take flight". Politico. Retrieved 25 March 2015. ^ "Pentagon faces a rebel yell over pensions". Financial Times. Retrieved 25 March 2015. ^ "US Government's 2010 Financial Report Shows Significant Financial Management and Fiscal Challenges". U.S. Government Accountability Office. Retrieved 6 January 2011. ^ "US Government's 2010 Financial Report Shows Significant Financial Management and Fiscal Challenges". US Government Accountability Office. Retrieved 6 January 2011. ^ a b "FY 2011 DoD Agency Financial Report (vid. pp. 25–29)" (PDF). Comptroller, Department of Defense. Retrieved 13 December 2011. ^ "FY 2011 DoD Agencywide Agency Financial Report (vid. p.45)" (PDF). Comptroller, Department of Defense. Retrieved 13 December 2011. ^ "Financial Improvement and Audit Readiness (FIAR) Plan Status Report" (PDF). Comptroller, Department of Defense. Retrieved 13 December 2011. ^ "DoD Agency Financial Report for FY 2011 (vid. p.46)" (PDF). Comptroller, Department of Defense. Retrieved 13 December 2011. ^ "DoD Agency Financial Report for FY 2010 (vid. p.44)" (PDF). Comptroller, Department of Defense. Archived from the original (PDF) on 27 October 2011. Retrieved 13 December 2011. ^ "DoD Agency Financial Report for FY 2009 (vid. p.23)" (PDF). Office of the Under Secretary of Defense (Comptroller). Retrieved 11 January 2011. ^ "FY 2008 Agency Financial Report (vid. p.21)" (PDF). Office of the Under Secretary of Defense (Comptroller). Retrieved 11 January 2011. ^ "DoD Agency Financial Report FY 2007 (vid. p.17)" (PDF). Office of the Under Secretary of Defense (Comptroller). Retrieved 11 January 2011. ^ "DoD Performance and Accountability Report FY 2006 (vid. p.74)" (PDF). Office of the Under Secretary of Defense (Comptroller). Retrieved 11 January 2011. ^ "DoD Performance and Accountability Report FY 2005 (vid. p.137)" (PDF). Office of the Under Secretary of Defense (Comptroller). Retrieved 11 January 2011. ^ "FY 2004, FY 2003, FY 2002 Component Financial Statements". Office of the Under Secretary of Defense (Comptroller). Retrieved 11 January 2011. ^ "DoD Agency-Wide Financial Statements Audit Opinion FY 2001" (PDF). Office of the Under Secretary of Defense (Comptroller). Retrieved 11 January 2011. ^ "DoD Agency-Wide Financial Statements Audit Opinion FY 2000" (PDF). Office of the Under Secretary of Defense (Comptroller). Retrieved 11 January 2011. ^ "DoD Agency-Wide Financial Statements Audit Opinion FY 1999" (PDF). Office of the Under Secretary of Defense (Comptroller). Retrieved 11 January 2011. ^ "DoD Agency-Wide Financial Statements Audit Opinion FY 1998" (PDF). Office of the Under Secretary of Defense (Comptroller). Retrieved 11 January 2011. ^ "Gates Reveals Budget Efficiencies, Reinvestment Possibilities". US Department of Defense. Archived from the original on 8 January 2011. Retrieved 11 January 2011.